This entry was posted in Cookies/Bars/Brownies, Food and Recipes, Seasonal, Valentine's Day, Winter/Christmas and tagged Cake mix, crinkle cookies, red velvet, red velvet cookies on December 9, 2016 by nancyc. I don’t make many recipes that use cake mix as an ingredient because I usually prefer making things from scratch. But I came across some different recipes for Chess Bars on the internet that use cake mix and I decided to make an exception! This 5-star recipe from SouthernFood (About.com) sounded good, and I happened to have a box of cake mix on hand, so I decided to try it out. 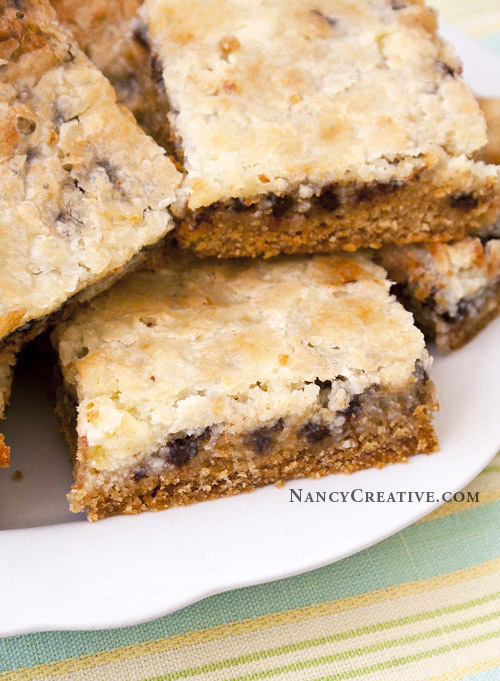 I made some minor changes to the recipe and added mini semi-sweet chocolate chips to come up with these Chocolate Chip Chess Bars! They turned out really yummy! They’re so rich and gooey, you’d think they have sweetened condensed milk in them, but they don’t. The richness and gooeyness come from the cream cheese, sugar, and butter. Needless to say, these are not very healthy! 🙂 But they are super-good, so the next time your sweet tooth is craving something, these bars will definitely hit the spot! In a medium bowl, combine cake mix, melted butter, and one egg, mixing well. Press this mixture, which will feel like a soft dough, evenly into the bottom of your 9×13″ pan. In another bowl, mix the softened cream cheese and the remaining two eggs together, blending well. Add the powdered sugar and mix until smooth. 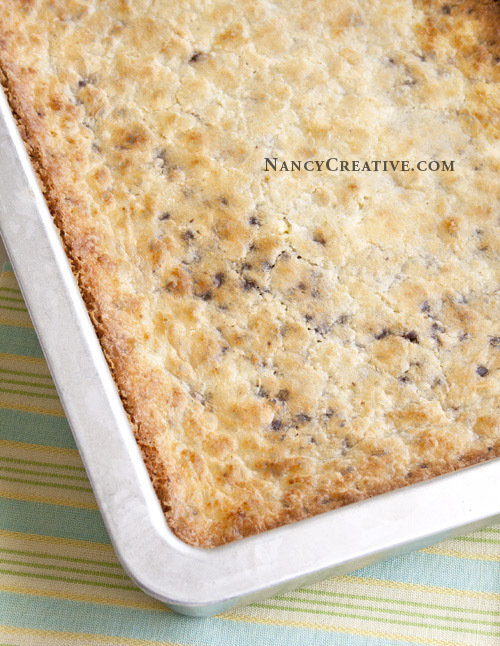 Fold in the mini semi-sweet chocolate chips, stirring to distribute evenly. Pour this mixture over the “dough” mixture and bake at 350 degrees for 40 to 50 minutes, or until top is lightly browned (my baking time was 45 minutes). Do you use cake mixes a lot in your baking? What is your favorite dessert to make with cake mix? 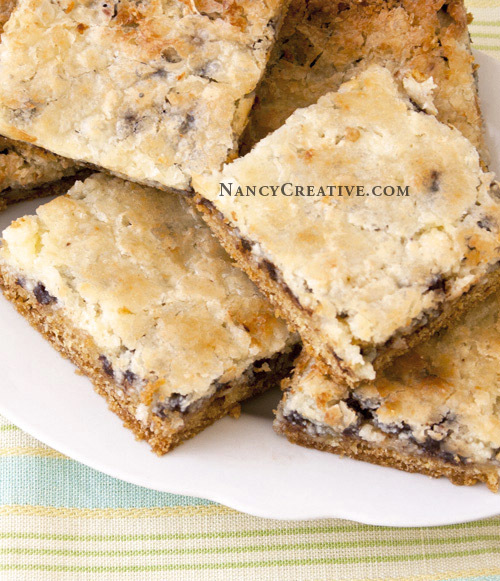 This entry was posted in Cookies/Bars/Brownies, Food and Recipes and tagged Butter, Cake mix, Chess Bars, Chocolate chip, cream cheese, Everyday on July 12, 2012 by nancyc.